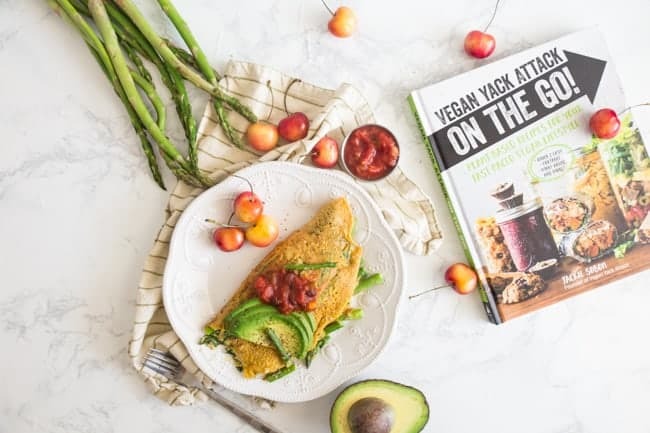 This easy flavorful and customizable Vegan Eggs recipe will have your plant-based breakfast life complete. Vegan eggs – that sounds like a whole lot of witch-craftery. Sure, I can handle making a flax or chia egg and adding it to a batter for baked goods. I understand that there are a number of different egg-type replacements like that – bananas, applesauce, and even the water left over from a can of chickpeas (aka the glorious aquafaba). But to actually create something that comes out in the form of a freakin omelette?! Now that’s just bazaar. You wanna know what’s even more bazaar about this crazy vegan egg situation? The flavor. The absolute deliciousness of the flavor. I’m not gonna lie. I miss a good scrambled egg so hard. 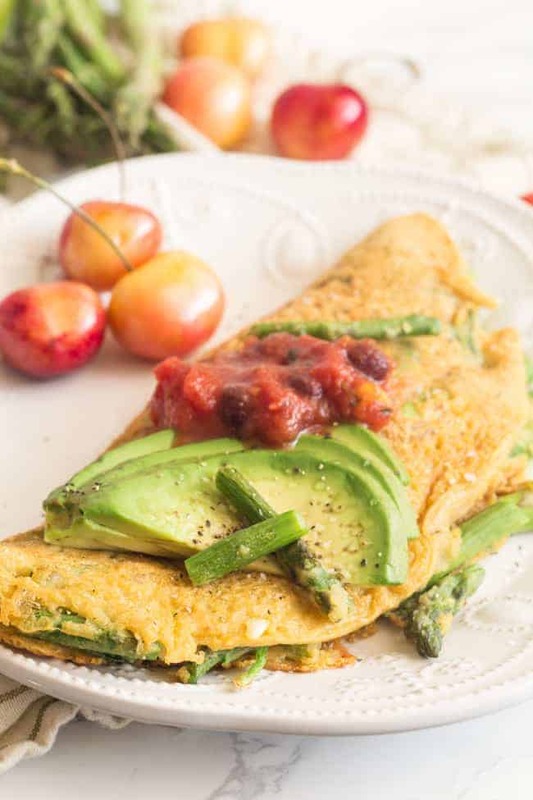 Before choosing to transition to a plant-based lifestyle, scrambled eggs or omelettes were my go-to. 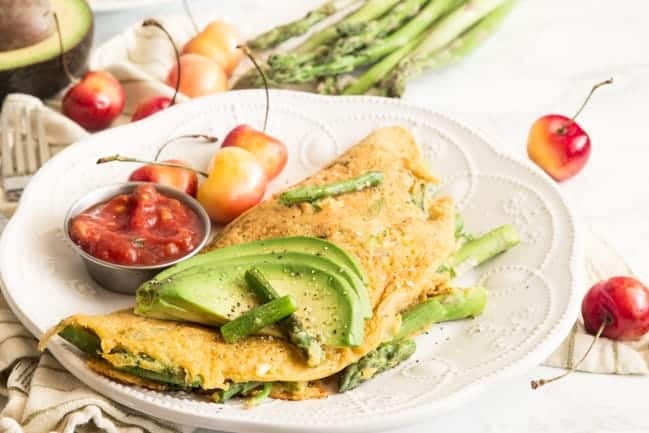 I never made omelettes at home (mostly because I was terrible at them and they always just turned into scrambled eggs), but every time we went out for breakfast, I had to order an omelette loaded with all the veggies possible. And before learning the magic of vegan eggs, I’ve just missed the ease of making scrambled eggs real quick. Whether it was to serve along with Sunday pancakes or even a quick weeknight dinner, eggs were a staple for me. In fact, scrambled eggs were the first thing I really learned how to make as a kid… and also the first thing I taught my son how to make on the stove. So to let go of the scrambled eggs… that was a big deal for me. and immediately ran to the store to pick up ingredients to make it all happen. I was beyond excited. I couldn’t contain myself. and a “Chicken” and Waffles recipe that looks to.die.for! All the recipes in the book are geared toward us busy folk just trying to eat a healthier and more planted-based diet. There’s not one recipe I don’t want to try in the book. Go grab yourself a copy for all the recipes – you will not be sorry. So let’s talk a little bit about the recipe itself. What is in vegan eggs? The ingredients here are actually pretty minimal. There may be a couple that are new to you, but let’s break them down a bit. Mostly simple stuff right? For the most part yes. Chickpea flour was new to me in this recipe. But it’s literally just dried garbanzo beans (chickpeas), stone-ground into a flour. 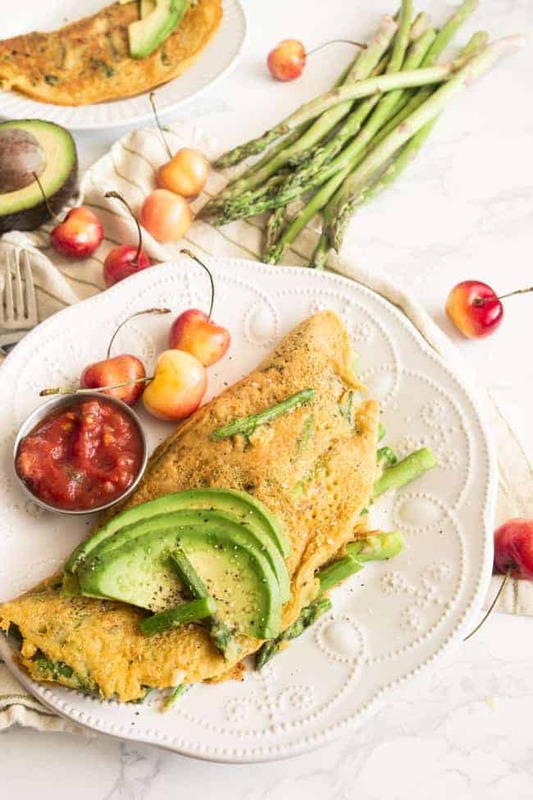 It’s high in protein, iron, and fiber – making it a pretty healthy option. I’m able to pick mine up from the local Kroger store, but it may not be as readily available to you. I found it here on Amazon as well. And what about this nutritional yeast. It’s such a weird one, but a total staple in any vegan’s life really because of the added “cheesy” or “nutty” flavor it gives off. But what is it exactly? 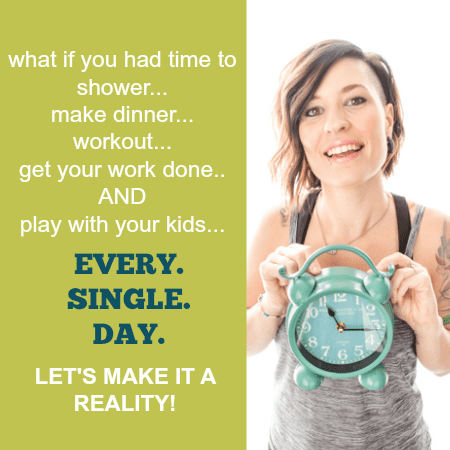 This article from FatFreeVegan explains what it is way better than I could. I’m always sure to buy a nooch that includes B12, as that’s one vitamin you’re unable to get from plants. Why can’t I just buy a manufactured vegan egg replacer? 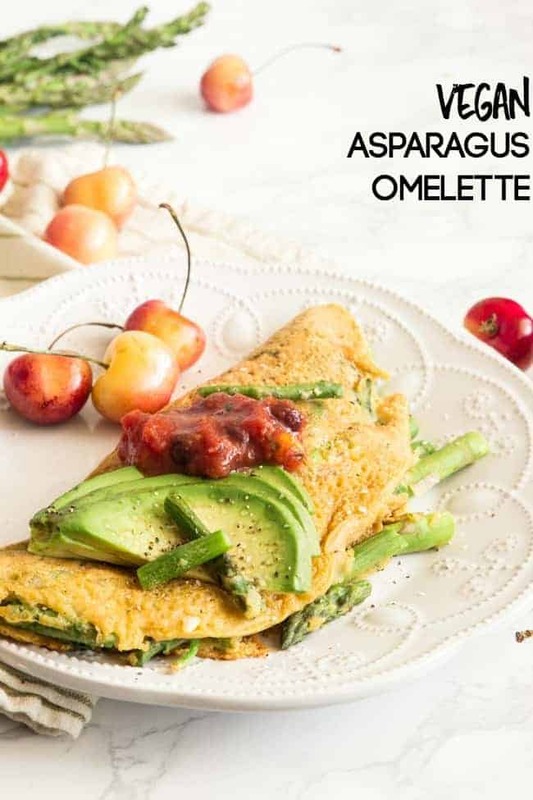 So there are a couple powdered products that you just mix with water that could potentially results in a similarly yummy omelette situation. And you know what – you be my guest. I’m all for you making your own choices. But I’m gonna tell you why I’m not into those products. These are the ingredients in one of them. I don’t even know what many of those ingredients are. And the carrageenan… yeah that’s a nope for me. And this is why I’ll be making my own vegan eggs from here on out… Thank goodness they’re so freakin’ easy! Jackie even suggests dividing the egg batter out into ziploc bags or jars to take camping with you! How brilliant is this?! But what do Vegan Eggs taste like?? You know? They taste a bit eggy! No really. dare I say I like these vegan eggs better than actual eggs??? And the texture is fluffy and tender just like you’d expect from an omelette. Then of course the additions are really up to you. 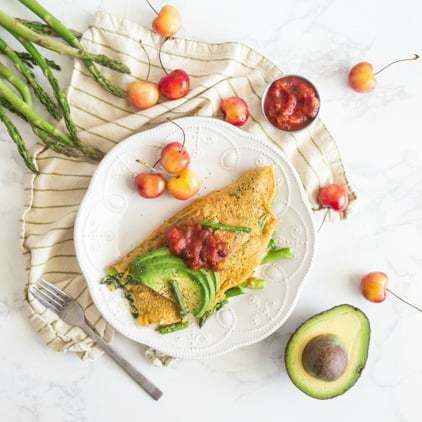 In this omelette, I loved using the asparagus, spinach, and shallots Jackie used in her recipe, but I’d imagine the possibilities are endless. 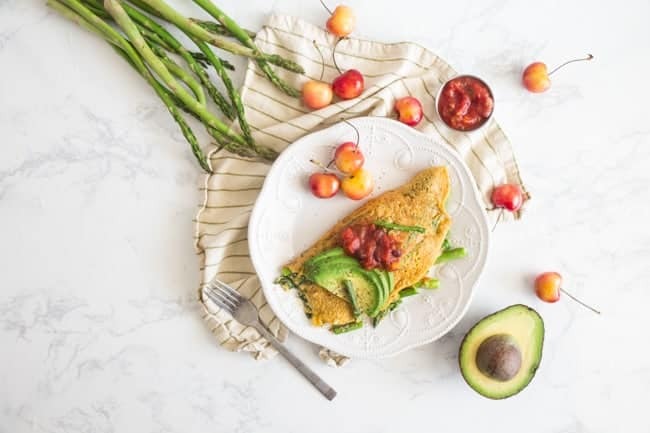 What did you enjoy in your non-vegan omelettes before plant-life happened? I’m thinking mushrooms, peppers, spinach, beans, tomatoes… all.the.things!! In a mixing bowl, whisk together the chickpea flour, nutritional yeast, cornstarch, salt, and black pepper until combined. Pour the vegetable broth into the flour mixture and whisk until smooth. Add asparagus, spinach, and shallots to the mixture and stir until combined. Heat a pan or well-seasoned cast-iron skillet over medium heat. Spray the pan with a thin layer of cooking oil. Once it is hot, add half the mixture into the pan and cook on one side for 5-7 minutes, or until the edges start to brown. Flip one half over onto the other half and cook for another 2 minutes. Repeat with remaining mixture and serve hot. Feel free to double or triple the recipe if you're feeding your family or friends.